I'm a little worried that I find myself rooting for a serial killer. In fact, I want him to go hunting. I want to watch him kill. I suppose this means that I have my own Dark Passenger. Thankfully he's satisfied living vicariously through Dexter. 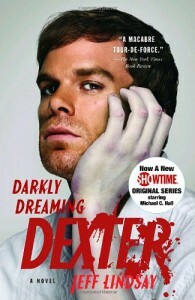 In Darkly Dreaming Dexter, we meet Dexter Morgan, a blood splatter expert working for the Miami police. He is also a serial killer who kills bad guys. He lives by the code of Harry, his foster father, and he loves killing under a full moon. When dead prostitutes, chopped into pieces and missing all their blood, begin to show up, Dexter literally salivates. This new killer is an artist, and one Dexter would love to meet and maybe even work with. But when the killer begins to leave personal messages for our delightfully twisted protagonist, Dexter has a big choice to make. Live by the code of Harry, or find another, perhaps more exciting, way. Althogh I loved this book, there are some flaws. One that people seem to complain about most is: Everyone but Dexter, who is our first person narrator, seems flat and uninvolved. You could even say detached. There's good reason for this, though. Dexter, in his overly narcissistic way, keeps reminding us that he doesn't feel human. That he cannot understand or even identify with his fellow co-workers and sister. Since the story is told in the first person, it stands to reason that all other characters in the story will come across as flat because that's exactly how Dexter views them. I came away from this book not feeling satisfied as Dexter might after a kill, but, like an alcoholic, craving so much more. I want to rush out to the book store and get the second one. It's just that entertaining for those with a dark passenger of their own. Get it, read it, and decide for yourself.